No amount of maintenance is capable of keeping your floors in optimum condition after years of wear and tear. If you are tired of the old and outdated flooring throughout your home, then it’s time to make replacement the next home improvement project on your list. Replacing this existing surface is exactly what you need to do in order to produce the results you desire. At our store and showroom, we are committed to providing quality flooring that meets the needs of every homeowner. Whether this means providing a product for a single room or even the entire home, there’s no reason why you should have to spend a fortune to get the fashionable floors you desire. 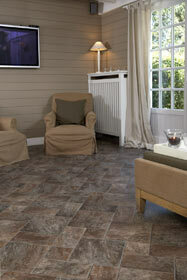 When you choose an option from our stylish collection of luxury vinyl tile, you get the look you want for less. Luxury vinyl, often referred to as resilient flooring, is designed with the needs of the average family in mind. As this name indicates, today’s modern vinyl is capable of remaining durable in the face of the damage most households experience. Perhaps one of the characteristics that makes luxury vinyl so popular is its ability to mimic both the look and feel of other coveted materials. Whether you appreciate the luxury of hardwood or desire the elegance of tile, there is a vinyl product perfectly suited to your unique tastes. When you’re ready to start shopping for luxury vinyl tile flooring or luxury vinyl plank flooring, you can depend on us to ensure the experience is just as easy as it is enjoyable! We take the time to understand your expectations in vinyl appearance and price, allowing us to point you towards the options most likely to satisfy. With so many different shapes, styles, hues, and textures to choose form, you can walk away with the vinyl of your dreams in a single visit to our store. Our commitment to your satisfaction doesn’t end when we make a sale. From selection to installation, we remain committed to ensuring you are more than satisfied with the new and improved surface. This is why we back the purchases made at our location with installation services performed by a team of in-house experts. These technicians handle every luxury vinyl tile installation with both speed and skill. We are so confident in the work of our installers that we back their work with one of the industry’s most impressive warranty systems. Is it time you seriously considered replaced outdated flooring with luxury vinyl tile? Learn more about the selection we carry by calling or utilizing the convenient, on-page form. We proudly serve Torrance, Palos Verdes, Rolling Hills, Lomita, and Rancho Palos Verdes, California, as well as the surrounding areas.